I figured I would do a review about a food pack since last week I reviewed the #3 Heavy Duty Pack from Duluth Pack. If you’re going into canoe country you will need at least two packs. The two I bring are usually the #3 Heavy Duty or on occasions the #4 Heavy Duty and the Standard Food Pack all from Duluth Pack. The Standard Food Pack is just that a basic pack that hauls your food. I use an old returnable beer bottle cardboard box to put all my food into and then I place that in the poly liner in the bottom of the food pack. This heavy duty cardboard box has worked well for me, but most beer companies are getting away from using them so when mine finally gives out I’m not sure what I will use. After I place the cardboard box in the bag I put the rest of the cooking gear in, which includes a large cook kit, a one burner stove, and other cooking related items. I usually have enough room for a 3-4 day trip for two to three people. When there are four people on the trip space becomes pretty scarce. 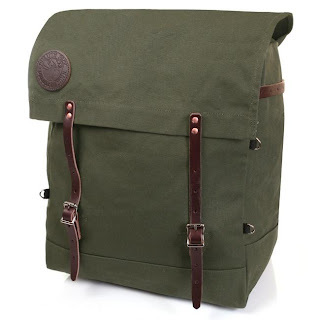 Two things that I wish this pack had are detachable side pockets that can be attached by the D rings on the sides and some kind of plastic box or wanigan that fits perfectly inside the pack. I know I could probably have Duluth Pack custom make some pockets for me, but I guess I’m surprised nobody has thought about selling them yet. I also think having some kind of wanigan or pre-made plastic container to store food would be brilliant. What I like about the wanigan idea is that you could have compartments to help you easily store your food and cooking supplies. Does not have a box or wanigan to shape the pack. There is a pack basket available, but I haven’t tried it. Leather strap stretched out because it got soaking wet and I lifted it by one strap when it was packed with food. Not that big of a deal, but I thought people should know. Overall, I love this pack and just wish I could add on a couple of extra items. If you need a food pack take a look at the Standard Food Pack from Duluth Pack. If you feel like this pack isn’t big enough for you it does have a big brother. The Camp Kitchen Pack. Of course that pack is almost twice as much.